Madiha Aijaz, These Silences Are All the words, 2017-2018. Courtesy the artist and The Tetley. Photos by Jules Lister. These Silences Are All the Words is Madiha Aijaz’s first solo exhibition in the UK. Combining text and photography with a series of short films, the project takes its lead from the public libraries of Pakistan. Yet rather than highlighting the grandeur of their architecture, Aijaz presents the library as an index of the religious, linguistic and ethnic composition of present day Karachi. Through a sustained engagement with their users and collections, the exhibition offers an insight into the major historical events which have shaped the city since the nineteenth century, including colonization, partition and its transformation into an international financial centre. However, in doing so, it also draws attention to the various channels through which these occurrences continue to shape the present, from the city’s ever-expanding outer limits to the place of English within Pakistani popular culture. The outcome is a complex meditation on language, urban space and the legacies of colonialism. 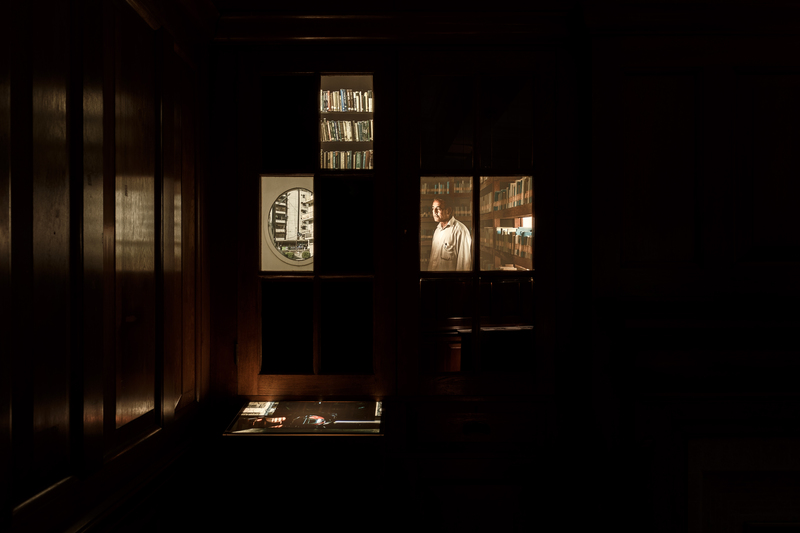 On entering the gallery, the viewer is presented with a series of backlit photographs installed in empty bookcases. Taken in various reading rooms across the city, the shots function as a portal into another space and time. By combining close-ups of architecture with portraits of the libraries’ occupants, they not only highlight the tension between the tranquillity of the library and the bustling city outside. Through their choice of framing and seemingly wistful tone, the images also present the reading room as a space in need of visitors. To complement these images, the exhibition also includes a series of smaller photographs. Formatted to resemble index cards, the shots depict a site in which the scholar and linguist Mauwli Adbul Haq (1870-1961) worked on a variety of publications, including Urdu dictionaries. These works are accompanied by three films, all of which address questions of language — as a means of devotion, a form of subversion and a tool for control. Comprising of two face-to-face screens, ‘The Visitor and the Librarian’ takes its lead from a quiet afternoon in the library. Whilst one screen depicts a visitor reading, the other shows the librarian performing afternoon prayers. ‘The Story Teller’, in contrast, adopts a more humorous approach to language, albeit for serious ends. Through a series of anecdotes about the use of English names for pets, the film offers an insight into the forms of linguistic dominance which emerged under British colonial rule. However, in doing so, it also forces the viewer to consider the ways in which these hierarchies continue to exist today; a line of enquiry that can also be found in the exhibition’s final short, ‘Memorial for the Lost Pages’. Madiha Aijaz, Installation Shot, 2018. Courtesy the artist and The Tetley. Photos by Jules Lister. Aijaz continues to explore these themes in the project’s central film, ‘These Silences Are All the Words’. Taking its lead from a series of conversations held in the Bedil Library in 2017, the work examines a range of topics in Pakistani history and culture. Yet rather than allowing the viewer to witness these interactions in their entirety, she presents them as a series of oral fragments. Set against a backdrop of overflowing bookcases, black and white portraits and unoccupied desks, these ghostly reflections offer an insight into the formal structures and historical conventions at play in Persian and Urdu literature. In this regard, the film also functions as a testament to the linguistic diversity of Karachi and Pakistan more broadly; a gesture that ultimately serves to unite the work with its accompanying materials. 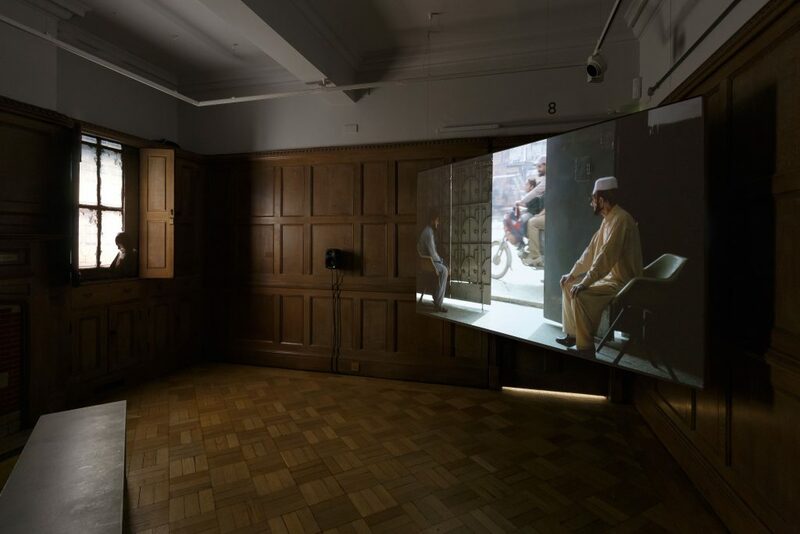 Madiha Aijaz: These Silences Are All the Words, The Tetley, Leeds, 9 February – 22 April 2018. Fiona Allen is a writer and art historian based in Leeds.